I'm in a new school this year. One that I love and in which I'm fortunate to have a beautiful building with K-8 students. 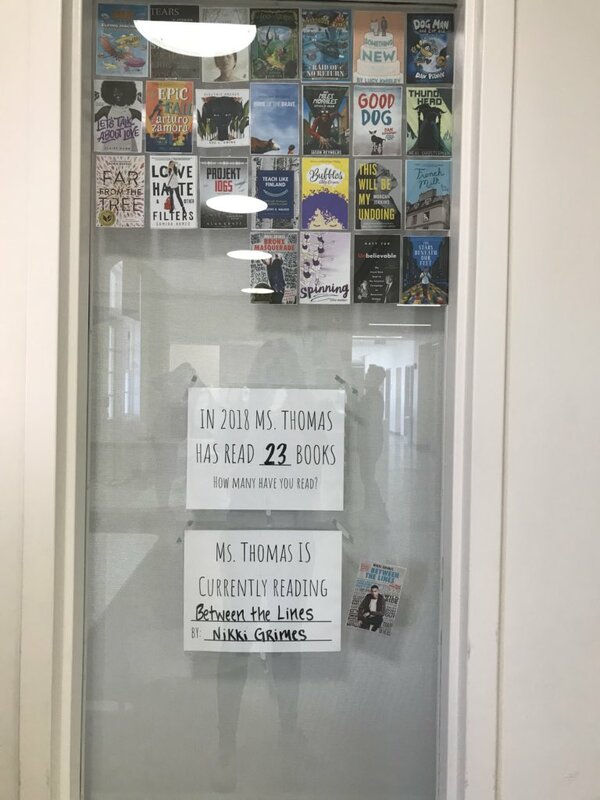 One of the things I have really worked on this year is spreading and sharing my love of reading by creating a culture of literacy throughout the school and sharing my reading life with students beyond the walls of my classroom. 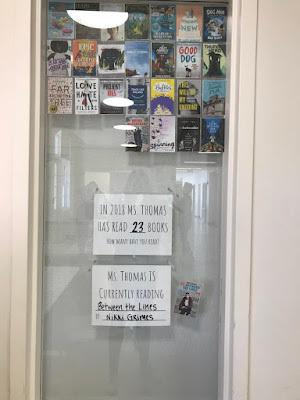 I have used several ways of trying to celebrate literacy in my little corner of the building, some of which have extended beyond just the middle school area. I've shared several of these in brief snippets on twitter, and have been thrilled to hear from other teachers who have been inspired to do similar things, so in the interest of having a thorough explanation in one place for other teachers/librarians to reference (and the prodding of Sarah), I decided to write this post to share what I've done. I honestly don't remember where I first saw this idea, though I'm sure it was a Nerdy Book Club friend, but I made the sign and put it outside my door early in the year. Shortly afterward, my principal asked if she could have a sign on my door also. Then it spread to the other middle school teachers. Of course to the librarian, her aide, and the reading specialist. And then to some elementary teachers downstairs. Now even to other educational aides throughout the building. 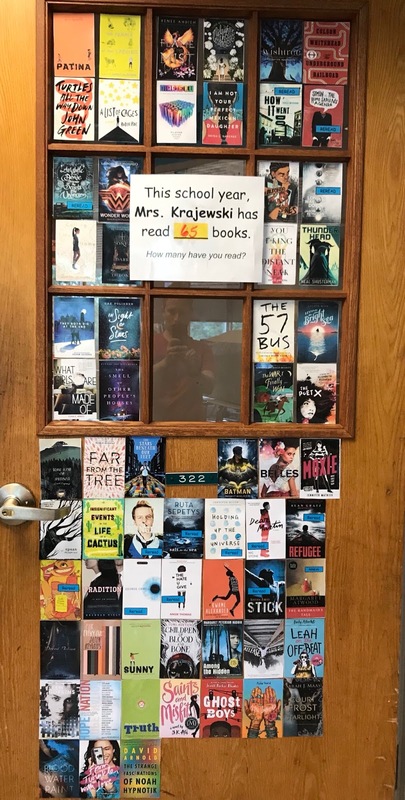 It is difficult for a student to walk through our building without seeing what adults are reading, and it's so important for them to see that adults are readers as well. Unexpected benefit? My students see my reading pace and notice how often I'm completing a book, showing how I prioritize making time for reading in my life in and out of school. Because I wanted students to also have a voice in sharing what they are currently reading, I made signs for each of them to keep updated as well. This is located right outside their locker bays and in a high traffic hallway that all students in the building pass through on their way to specials classes. Unexpected benefit? It allows a quick at-a-glance assessment for me of what students are reading and how often they're finishing books every time I walk by. Early in the year when I was doing goal setting with students, I set my personal goal to read more books than I read last year. I read 68 novels last school year, and as I quickly realized, I was on pace to read quite a few more this year. In addition, this is the first year I've done the 40 Book Challenge (adapted from Donalyn Miller's The Book Whisperer). 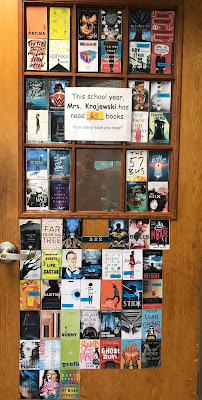 I wanted a way to celebrate the reading I was doing this year, while also encouraging students to keep going with their challenge, and having a way to share the books I've read with students. 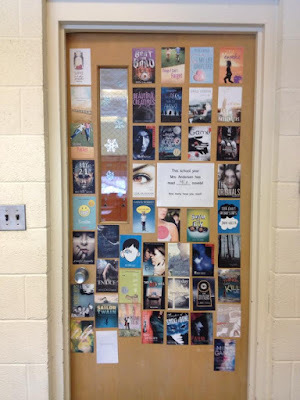 Thus the Books I've Read This Year door (which morphed to the window next to my door so it could be seen at all times). It was pretty easy as I just use the book cover image from goodreads and put them four to a page in a Word document with two columns. As soon as it went up, I had students commenting on it and asking about certain books. It's been a great way for me to keep track of and tally the novels I've read this year, which is something I'm asking my students to do with the challenge, and I try to always do anything I'm asking them to do. This is from a few weeks ago. I'm now up to 82 novels! Unexpected benefit? The ability to have a visual to reference when students or staff are asking me about any of the books I've read. As I've come to realize, reading such a higher volume of books than in the past leads me to sometimes want the visual to help remember them all. 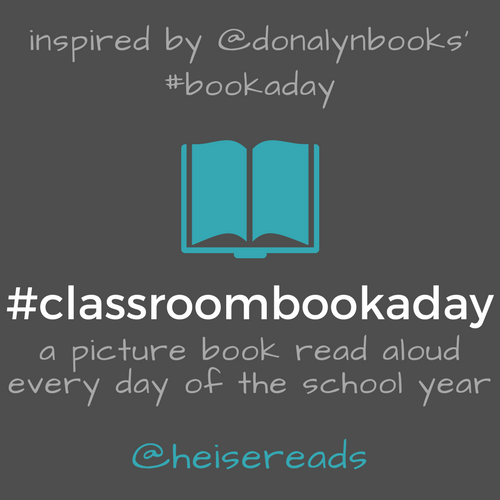 *Notes: The reason I say novels is because I consider picture books to be real books, but wasn't including them in my tally for the book challenge purposes, and I didn't want to diminish the importance or value of picture books for my students. Also, I'm tallying for the school year because that's what my students are doing. I have a separate calendar year tally via goodreads. Finally, I added the line "How many have you read?" because it was important for me to try to put the focus back on the students and how it could apply to them. 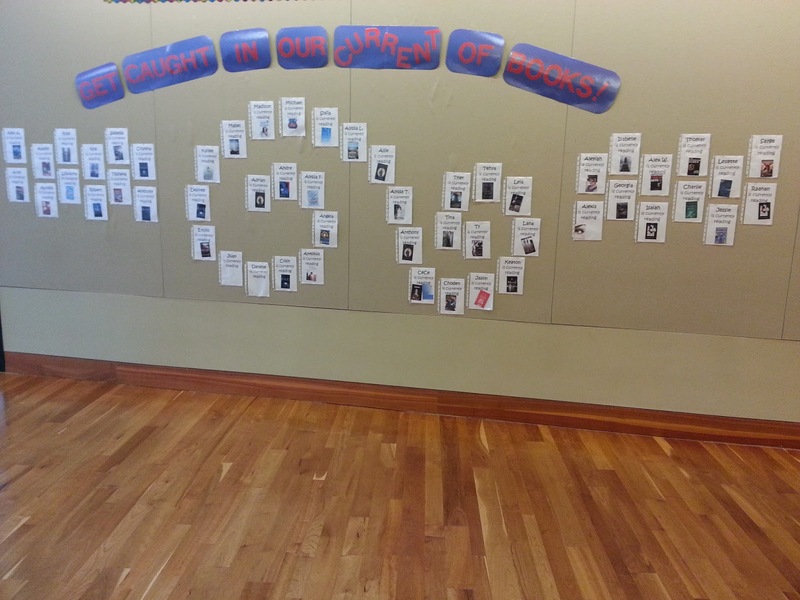 When I shared this one on twitter, and was encouraged to post it on Pinterest as well, I had a great response from other teachers who were doing their own versions of these Books Read Displays. I'm so glad that something I did on a whim has led to students across the country encountering a similar celebration and sharing of reading in their own classrooms. It has been so fun to see the tweets from teachers who have done their own doors/posters/hall displays. Through the discussions, some enhancement ideas: indicating not only read alouds, but also rereads, audiobooks, novellas, etc. Also, using star stickers to put on each cover to show what I thought of each book. So that's what I've been working on this year. It's been a lot of fun and inspiring for me. If anything clicks with you, I'd love to see your iterations of any of these ideas! So much fun! I love it. It's pretty awesome to see how all the pictures add up. I love the visual reminder, too! I can usually think of a few books to recommend right off the bat, but having a list or going through GoodReads always helps me remember other books to recommend. Cool to see how others are doing the doors/walls, too! Thank you! I do really like the visual reminder - in fact, I think I'm going to take a picture at the end of the year before I have to take it all down, so I can still have that visual at hand at the start of next year. Love this. Right now, I have a list posted in my room, but I have a gallon of red paint in my room so I can paint my door and make a "READ Box" door. 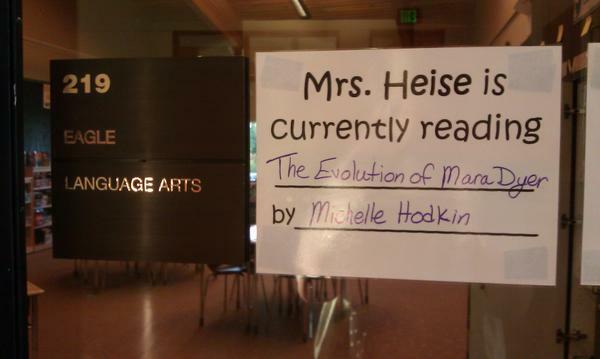 I have found that whatever book I write on my "Mrs. Day is reading...." sign soon has a wait list. A great benefit! 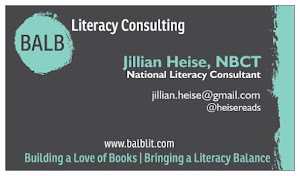 I have also posted my professional books when I'm reading them because i think it's important my kids know that I'm always learning as well as I'm reading. That's such an important point about kids knowing we're always learning as well. I may have to that next year. I had a more specific focus this year of building reading enjoyment and title recognition for all, but there are other aspects that are important. I might even add a picture books I've read wall. Yes! Modeling is so important. Interesting how you're doing that with the revision process. Would love to hear how that turns out. This is such a great idea! I definitely think that teachers should make their reading lives public. 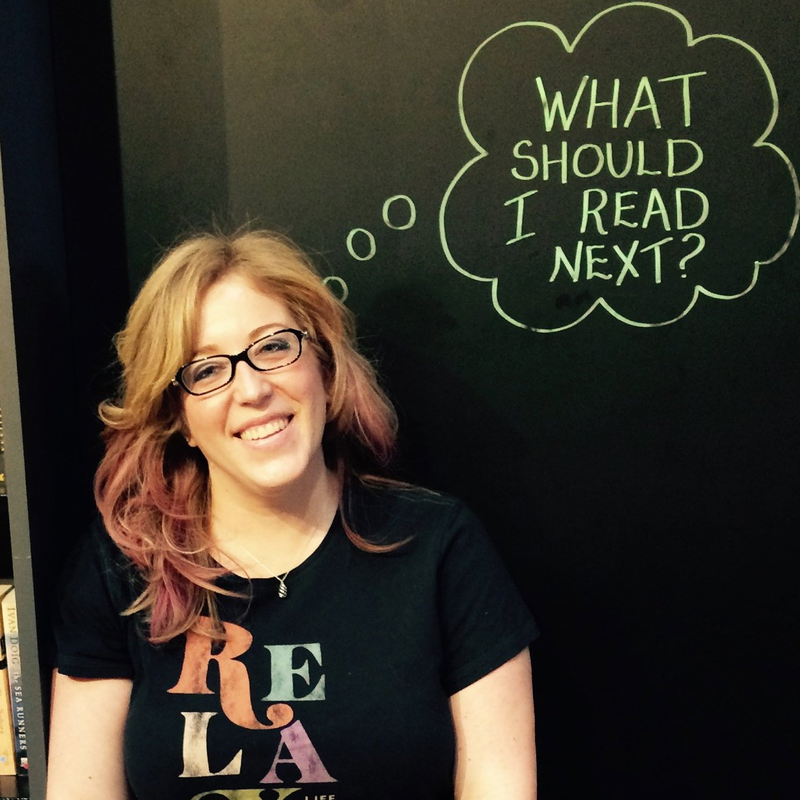 As a ninth grade English teacher, I've found that students should do the same. Do you have ideas? Sarah Andersen's literacy lockers sounds like a great one, but I'm wondering if you or other teachers have done student displays in the classroom. Thank you! Thank you! Yes, I love Sarah's idea of the literacy lockers. I haven't done more student displays in the classroom, but I'm working on figuring out a way to make that happen next year. I have the currently reading wall for students, but I'd like to do something showing what all they've read. 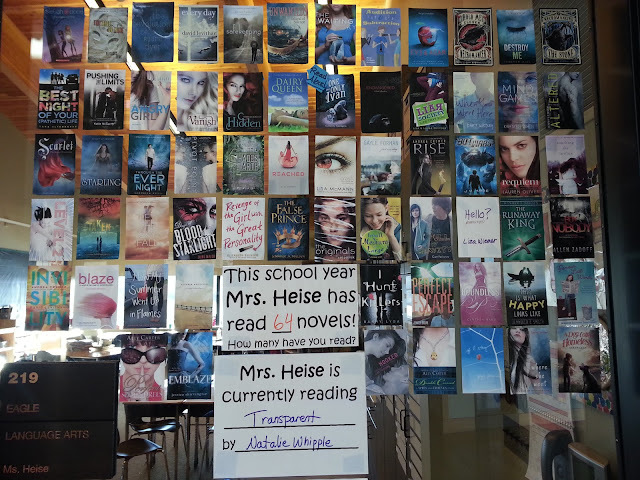 I'm thinking maybe after they take the book cover out of their currently reading sign, we might just add them to a bulletin board (similar to my window) that would show what ALL of our 7th & 8th graders have read for the school year. Could be a powerful display. I will also be taking pictures of students at the end of the year with signs they make for the total number of books they read. For my 7th graders I'll have for 8th grader next year, we'll be able to have that up at the start of school as a reminder/motivator to read even more. Question - do you limit your reading to books appropriate to your students, or do you sometimes sneak an "adult" book in there too? There is tons of great middle-grade and YA out there so it's hard to keep up, but it would be good to have some adult books too.